In the 2012 edition of its flagship report, Worldwatch celebrates the twentieth anniversary of the 1992 Earth Summit with a far-reaching analysis of progress toward building sustainable economies. Written in clear language with easy-to-read charts, State of the World 2012 offers a new perspective on what changes and policies will be necessary to make sustainability a permanent feature of the world's economies. The Worldwatch Institute has been named one of the top three environmental think tanks in the world by the University of Pennsylvania's Think Tanks and Civil Societies Program. "The most comprehensive, up-to-date, and accessible summaries . . . on the global environment." 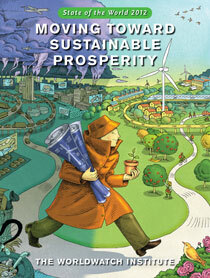 "Top-ranked annual books on sustainable development." "A wise read for the world's future, Moving Toward Sustainable Prosperity is a solid and much recommended read for environmental and science collections." "Together with 35 pages of referenced notes and a 15-page index, the...chapters constitute a worthy, excellent-value compendium of environmental information." "...it has provided compelling and increasingly sophisticated analyses of those challenges; and it has helped to bring coherence and direction to the study of global environmental governance. In doing so, the series has increased the capacity of the policy and scientific community to meet the challenges of the next century." 4?2 Principles for Transport in Urban Life, by Michael Replogle and Colin Hughes . 11?2 Japanese Efforts to Build a Sound Material-Cycle Society, by Yuichi Moriguchi .